One of our neighbours, who writes the excellent Blog Waterloons, brought to our attention the tender for the reconstruction of Moore Avenue from Emma to Graham. Is there any plan for sidewalk infill and/or bus stop pad on Moore Ave? If not, why? Due to the large number of mature trees that would have to be removed to install a sidewalk on the cemetery side of Moore Avenue, we will only be installing sidewalk where it already exists as part of this project. 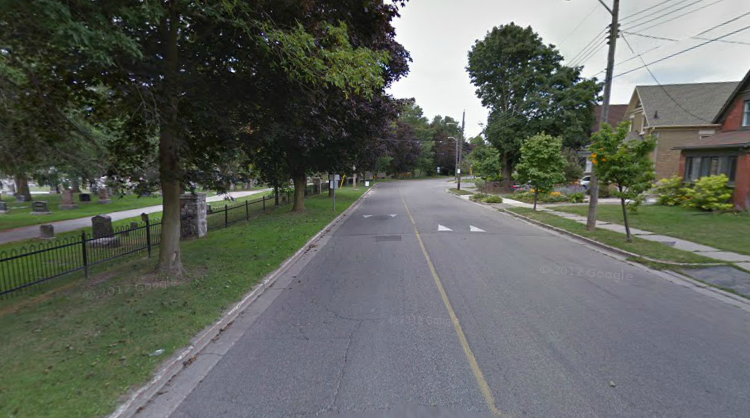 A concrete pad will be installed at all GRT stops on Moore Avenue including a new one at the stop near Peltz Ave..
Is there any plan for cycling lanes on Moore Ave? It is correct that this section of Moore has been identified as a proposed on-road bikeway. The road will be signed as a shared use facility, but no designated bike lanes will be installed. This is consistent with the cycling master plan. Will the new road have any traffic calming features? At the end of construction this summer, the traffic calming features, namely the speed humps, will be reinstalled temporarily (for a period of two-years) at which time the final layer of asphalt will be installed and the permanent humps will be installed as they exist now. I trust this answers your questions. Please feel free to contact the city of Kitchener should you require more information or clarification. Thank you Waterloons for your contribution to our bank of information!